We have additional information available on this site for Crusieline Professionals, specifically Cruiseline Housekeeping Managers and their crews who will obtain useful information regarding the monitoring of Bed Bugs in their work environment. 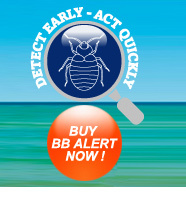 In order to access this information we kindly request that you register with us so that we can keep in touch with you in future regarding the development of new monitoring and Bed Bug related products. Please note that we respect your privacy and under NO circumstance will any of your details be revealed to a third party without your express permission.